Am I the only one feeling like Halloween was just two days ago? Time surely flew so fast as soon as the calendar hit November 1, 2010. In years past, I always get in that holiday baking mood right after all the Halloween festivities. I stumble upon some amazing recipes that I try and test in the weeks leading up to Thanksgiving. With everything that’s going on, time escaped me and now I have very little time to plan my holiday baking. Thank goodness I have an arsenal of tested recipes that my friends and families have enjoyed over the last few years. 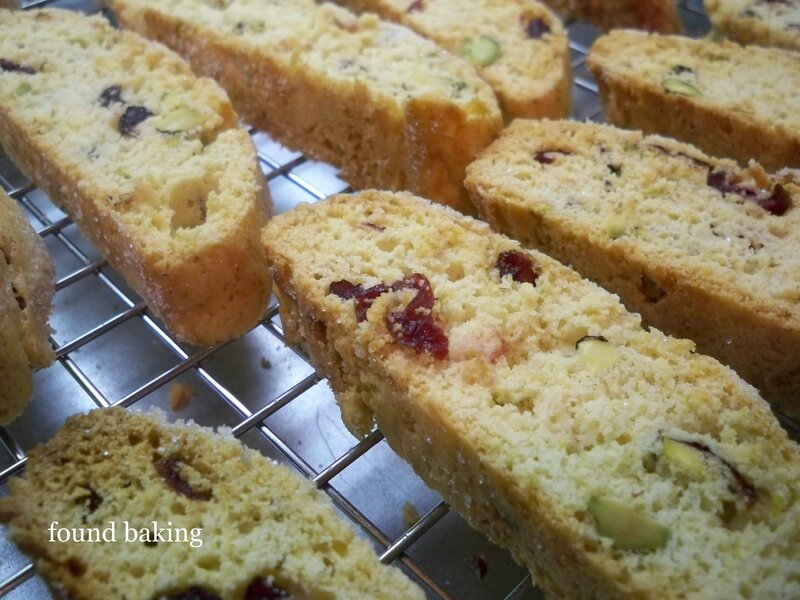 One of which is this biscotti (Italian for “twice-baked”) recipe brightly showing off flecks of red and green as the cookies are studded with dried cranberries and pistachios. 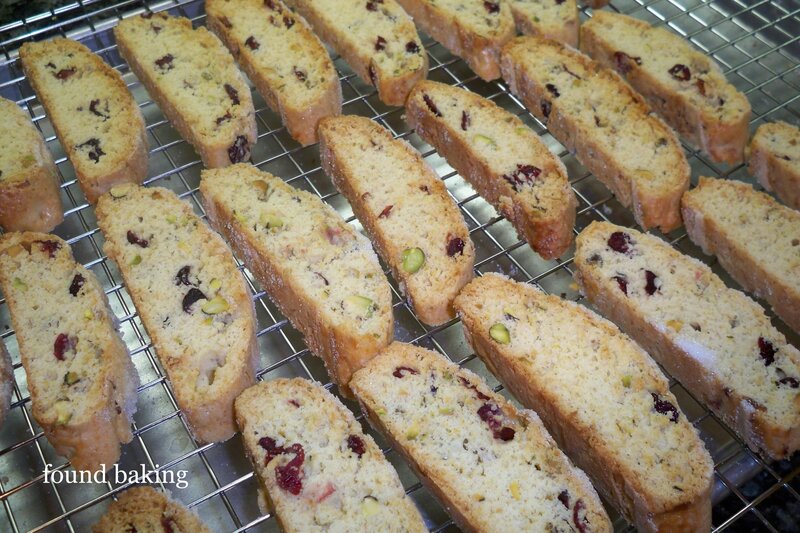 It is one of my favorite biscotti recipes ever. I have given them away for the holidays at my work, my husband’s work and to my neighbors. It’s the perfect homemade edible gift. I love the versatility of a biscotti. No refrigeration required. Sturdy enough to withstand the bumps of shipping and handling. Well-rounded enough to be enjoyed as a breakfast or a snack. And the fact that biscotti have a longer shelf-life compared to cupcakes or tarts… not that it belongs to the same category as cupcakes or tarts and not that these addicting cookies will stay in your kitchen pantry for as long as it could because it won’t. Trust me, you’ll reach for one right after the other. I am also donating these yummy treats to the upcoming Eat My Blog bake sale at Tender Greens on December 4th. The charity event is hosted by Cathy Chaplin of the well-respected Gastronomy blog, and Diana Hossfeld of the beautiful Diana Takes a Bite blog. I am so stoked to be participating again for the Winter edition of Eat My Blog. It’s a fabulous event where you find yourself surrounded with the most tantalizing desserts by Los Angeles bakers and bloggers. All proceeds go to the LA Regional Food Bank. More information on Eat My Blog here via Facebook. This recipe is from Martha Stewart’s Baking Handbook. Yields about 4 dozen. 1. Preheat the oven to 375°F. Prepare a baking sheet and line with parchment paper. 2. Place dried cranberries in a small bowl. Pour the boiling water and set aside for 15 minutes until the cranberries have plumped up. Drain and then set aside. 3. Sift together the flour, baking powder, and salt into a medium bowl (or sift over parchment paper like I do) and then set aside. 4. In the bowl of an electric mixer fitted with the paddle attachment, beat the butter and sugar on medium speed until light and fluffy, about 2 minutes. Add 3 eggs, one at a time, beating well after each addition. Scrape down bowl as needed. Beat in vanilla. 5. On low-speed, add the flour mixture until just combined. Mix in the dried cranberries and pistachios (or mix in by hand). Do not overmix. 6. Turn out dough on a lightly floured surface; divide mixture in half. Transfer the dough into the baking sheet and shape each half into a 16-by-2 inch log. Make sure the logs are at least 3 inches apart from each other. Flatten the logs lightly using the palm of your hand. Brush the beaten egg on top of the dough and sprinkle generously with sugar. 7. Bake, rotating halfway through, for 25 minutes until logs are slightly firm to the touch. Transfer logs on parchment paper to a wire rack to cool slightly, about 20 minutes. Reduce oven temperature to 300°F. 8. Place logs on a cutting board once cooled. Using a serrated knife, cut the logs crosswise on the diagonal into half-inch thick slices. Place a wire rack on top of your baking sheet. Arrange slices cut sides down, on the rack. Bake until biscotti are firm to the touch, about 30 minutes. Let cool completely on the rack. Store them in an airtight container at room temperature for up to 1 week. Oh I’m so happy to see you again! It has been too long since your last post. 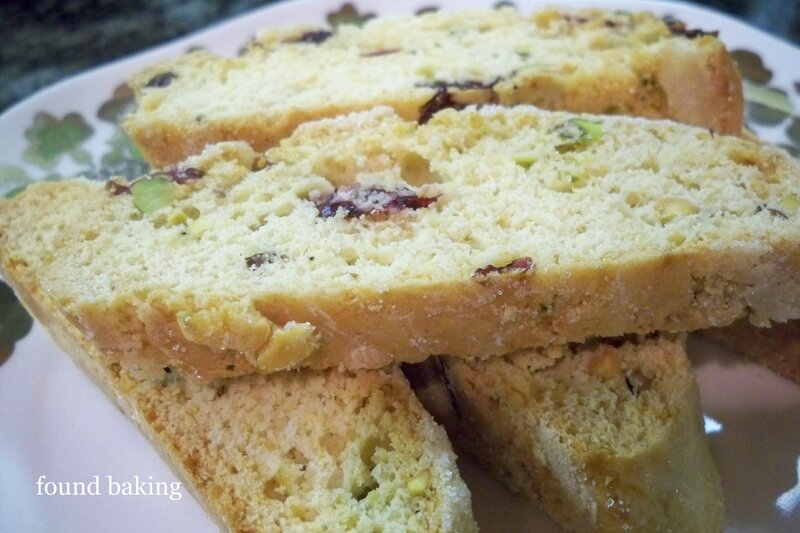 This biscotti looks amazing…and it utilizes my favorite nut. I just bought a pound of pistachios yesterday, and I imagine that these would be perfect for upcoming holiday parties. Thank you so much for sharing…and thank you for donating to a great cause! I’ve been so busy lately but I am making sure to find time to post new stuff. I love pistachios on anything! Ice cream, cookies, cakes, and tarts. I think it’s my favorite nut hands down. Thanks Monet! Thank you Diana! I am excited to be part again of Eat My Blog. This is a great cause and my little contribution will surely move a mountain to those who are in need. I know the day is fast approaching! Here’s to another successful EMB event!!! Cheers!